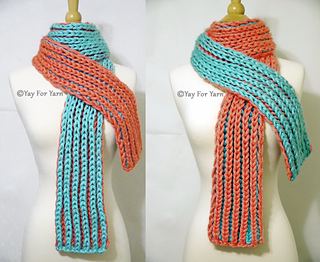 Click Here for VIDEO TUTORIAL with written pattern! Finished Size: 6 1/2″ x 64″. Feel free to adjust size as much as you like, making sure that you purchase enough yarn to accommodate the larger / smaller size. Yay For Yarn Copyright© 2016 – Current. All patterns and photos are owned by Yay For Yarn.